Cypress Trunk And Roots, Stonecrop In Bloom, Point Lobos State Natural Reserve, California, 1948 by Philip Hyde. 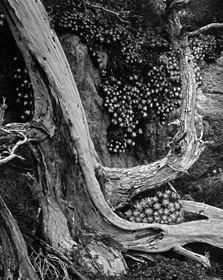 Curators have said this Philip Hyde photograph at Point Lobos shows the influence of Edward Weston. It was made the same year Philip Hyde met Edward Weston. Also, Edward Weston may have been present while it was made on a California School of Fine Arts field trip with Edward Weston and Minor White. Edward Weston’s photographs exhibit a strong sense of location, of place, of physicality and yet a universality. He showed us the extraordinary in the ordinary. Through details, textures, tactile sensations and the undulating forms of rocks, trees, nudes, ocean waves, vegetables and shells, he brought us the world. I am not trying to express myself through photography, impose my personality upon nature (any manifestation of life) but without prejudice nor falsification to become identified with nature, to know things in their very essence, so that what I record is not an interpretation—my idea of what nature should be—but a revelation or a piercing of the smoke-screen artificially cast over life by irrelevant, humanly limited exigencies, into an absolute, impersonal recognition. It can of course be argued that all photographers, indeed all artists, impose their personality on their creations. The “art as expression of the artist” argument holds aspects of truth, yet is not the whole story. A landscape photographer, or landscape philosopher, could go to the opposite extreme and say that once he or she reaches the proper state of attunement or union with nature, that he is no longer in the creation process at all. The landscape photographer then becomes a conduit through which creative forces flow. He has let go of attachment to his own ego and is moved, no longer acting as the mover. Some might say he is divinely inspired. On a practical every-day level, each of us works in a range somewhere between these two opposites. Yet, is it healthier for the photographer to believe he is the one who has made the creation? I know of many photographers who believe they are the reason for their success, when there are thousands of factors and happenstances every day that could tip their career one way or the other. My father, landscape photographer Philip Hyde had his own particular method for keeping his ego in check. He attributed his photographs to God, or Nature, rather than taking the credit himself. Check Your Ego Before You Go Out To Photograph…? Odds are good that some manner of narcissism enters into either end of this continuum, while a healthy creative perspective is best maintained somewhere in the balance. Yet when photographing nature, is it not therapeutic to seek the purity of perception that Edward Weston and my father pursued? Some might say it is too idealistic, too filled with romanticism and self-delusions of a nature made enlightenment; but it seems a more attractive notion, in my opinion, than the puffery expressed by photographers who think their work is all about them. Perhaps ultimately either can lead to the other. Eastern philosophers say that one studies the self to eliminate the self. What do you think? What do you observe is the difference in outlook or philosophy between photographers who are arrogant and those who are not? Arrogance is assuming you fully understand your own actions, fears, or desires. To believe the ego is fully in control of the creative process, and you have full control over your vision, that’s egocentric, to say the least. I’d hope in an artist’s own processes and work they sometimes find suprise and wonder at the nature inherent within their own work. Looking back at portfolios and finding themes that were never intended at the time. I find those more open and less arrogant are the ones who are open to play at what they are doing. That open and playful quality goes a long ways. Hi Darren, thank you for furthering the discussion with great points and observations. I appreciate your insight. We would all be wise to remember play and openness. At first I thought you were Derrick, who comments here from time to time. Thank you for joining in, Darren. I just looked up your Flickr photo stream. I very much like your style of photography. I would label it straight photography, but label or no label, you have captured the imagination of many followers with your quiet, yet strong compositions. The ground view close-up with the flower coming out of the sidewalk is stunning. It reminds me a bit of my father’s photographs of small plants growing out of barren sand, or trees out of rock walls, and that is intended as the ultimate compliment. I am happy to have your comment here and I appreciate your reading this blog. Please visit again. Weston said in his daybooks that he wasn’t interested in expression, but rather in presentation, in making a pepper more than a pepper as he put it. How can there not be a certain amount of expression in that? I’m right there between the extremes on this question. Photography is going to involve expression. Simply by choosing a subject and arranging it into a photo, you are expressing what moved you to make it in the first place. The only way to avoid that is to hold a camera in front of you and not look at what you’re doing. I agree with your dad — I don’t create my subject matter. It already exists all around me. I just try to find it. Any creativity involved is in framing the elements in a way that moves me the most. I’ve found out over the years that there is a lot more interesting stuff going on all around me than there is my little head. I appreciate your participation, PJ. When I started to write this post, I had planned to quote Edward Weston a number of times, as he wrote much more about photographing nature than just the quote here. However, as strange as it may sound, after reading Edward Weston for a while, I had this unusual sort of contact high, much like the one I wrote about having when viewing my father’s original transparencies for a period of time. I was inspired, the words just sort of flowed out and I wrote what I wrote. I put it away for a while thinking it was a little too far out. I wanted to temper it with other Edward Weston quotes that would shift the focus some so that this “flow” versus “expression” subject would only be one part of the blog post. However, I have a lot of other work going and decided to leave it. The idea presented is a bit more debatable, more unfinished. I have a tendency to put forward a good argument and seal up the case with solid conclusions rather than toss the seed on the breeze and let it drift. So I am working more on letting the wind and the birds carry the seed. Sure enough, PJ, here you come along and add more Edward Weston quotes to the discussion. By letting go, I experienced what I intended, but this is more fun because it is team-created too. Artists tend to move back and forth between complete creative control and complete surrender, probably rarely all the way to either end. Dear David, again a wonderful one of the early photographs of your father. It is a dialogue with these old roots, with the trunk, that shows it’s experience of a long tree-life, with the curious looking little flowers. It is a photograph that is made with sympathy and love. Arrogant photographers produce nothing but monologues. There is no sympathy, no love. Thank you, Peter. You have expressed more succinctly what I’m saying. Dialog with others, with nature, with our surroundings. Landscape photography, perhaps any photography, is more finely executed as a dialog rather than a monologue. An ego check can be regular thing for some. I can get a hard time from people sometimes, if I get mad I think the ego comes out and I have to check it. It does have it’s good sides by pushing you become more creative at times. I wish I could tell when a piece was ego driven. Hi Steve, thank you for your input. I miss hearing from you and seeing your posts when you are gone out in the field so long, but I realize it is part of what you are meant to be doing. I love your latest landscape you posted of Bryce by the way. It’s very hard to judge whether one photograph or another is ego driven, especially because most all of our art has some ego in it. It may be easier to tell from a body of work, or when the photographs made by one photographer are grouped next to those from another. But the part of me that is judging the level of ego involvement in someone else’s photograph is my ego. It could be argued that any judging or comparing at all is a function of ego. It is when we move beyond the mind, beyond judging when we may leave behind the ego for moments, or in part, probably not completely or permanently. And the ego is not all bad, necessarily, as you say it can drive one to create. The ego can even cause one to work to eliminate the ego. Even so, there is also a place beyond ego as well. Maybe it takes significant ego to write this much about ego. I suppose it is helpful to also differentiate between ego and arrogance. Some use the terms synonymously, but maybe there are ways to maintain ego without allowing it to become arrogance. Also, I have seen those who become arrogant about their own lack of ego, which of course is not lack of ego at all, but self-delusion. The ego can be very tricky and can’t be left behind by resisting it. It is only by letting go of all this kind of mind-chatter that it may fade. I think my best pictures are ones that are taken when I am thankful. Without God’s beautiful creation, I would not have much to photograph and I am always thankful for that. Pride not only goes before a fall, I think it can keep you from climbing to start with. Hi Sharon, well said. Pride is a heavy load. It was originally one of the seven deadly sins, but many people have twisted it into a virtue. I know that I create nothing within nature. Nature’s works of art are for all of us to enjoy, a gift for all of us. When ego gets out of the way are we able to truly present what nature has created and that is another gift. Hi Monte, thank you for your contribution. I appreciate your visit. I wonder if moving small items in the frame would be considered off-limits by Edward Weston? His son, Brett Weston did it, as did other Monterey Peninsula photographers. One of the photographers from the area during the Group f64 black and white heyday, who later helped my father learn color dye transfer printing, Dennis Brokaw, was friends with Brett Weston, Cole Weston, Ansel Adams and Wynn Bullock. Dennis Brokaw did it. He told me recently it was called house keeping and apparently was standard practice. It’s probably part of choosing what to include in the frame. Moving larger objects out of the frame might be more objectionable, or adding items to the frame. However, Edward Weston placed shells and other items on the rocks near the ocean at Point Lobos. He also disclosed it. Probably if it is explained, anything goes, even to a certain extent for straight photography purists. My father may have been more of a purist than any of them because he was not only a straight photography purist, but a nature purist. He was interested in capturing nature as it was, not enhancing it. He liked to see some “flaws” and minor or even major “ugliness” in his photographs. That way he was not just presenting “pretty pictures for postcards.” Even our selection of his photographs now leans more toward the prettier pictures than he ever used to select for his own exhibitions and books. I think the ego of some photographers is evident when they start talking about how they “created” the scene, almost as if they had the power to make it happen. On the other end of the spectrum are those that are just happy to witness some of nature’s majesty. How anyone can gaze upon the natural wonders of the world and have any kind of ego whatsoever is absolutely beyond me. Hi Derrick, glad to have you mention this important aspect of the issue. Anyone who closely observes nature is in awe, not so much in a state of dominion and control. I wonder if for some people photographing nature is a form of conquest or perceived mastery over the world, or life. Some certainly do act that way. I was once told never to give my secrets away by a colleague, to which I replied that I didn’t think any existed. He insisted that indeed there were many, and I would be wise to guard them with my professional life. After some thought, I finally relented and admitted he was right. I realized this secret was “humility” and the ability to realize the true gifts nature bestows upon me each and every time I venture out with my camera. Knowing that I am nothing more than a mere witness to the beauty and wisdom of the natural world has done more for my photography than anything else I can think of. Arrogance has never provided me anything more than frustration at how little I know and how much there is to learn, a lesson I have learned well. Thank you for visiting Robert. You put it very well. I just looked at your blog again and am blown away by the one you have up at the top right now. Photo of the Day – Mirror Trees, Harriman State Park: http://robertrodriguezjr.com/blog/2010/11/16/photo-of-the-day-mirror-trees-harriman-state-pk/ That is a masterpiece gift from nature, a fine work of art. David, I’m not entirely sure I can add to this already fantastic discussion, but here’s my take on it; I’ll add a caveat at the end. I’ve run into a few photographers who I felt were pretty arrogant, not only about themselves but their work as well. Similarly, I know many more photographers who aren’t arrogant. My observations line up with your own: those who are humble seem to have more creativity flowing through them. Those who are arrogant simply are harvesting images, not creating art, IMHO. Hi Greg, thank you for adding this. It is a good confirmation. However, the challenge is, the arrogant ones certainly won’t listen to us. Who are we to tell them anything? Not that I believe we should, I just notice that they think they know it all already. Thankfully, I don’t and I hope I never even come across that way by accident. If I do, please kick me. You’re absolutely right, its neither my prerogative nor my desire to fill the arrogant in about their sins. I just take some solace in the idea that the art created by the humble will be that which moves people. Perhaps I’m wrong, but look at Edward Weston and your father: moving, humble work. Ansel Adams too, was quite a remarkable, humble man, considering all that he accomplished in his life. He was extremely generous and kind too. I have heard through the grapevine, though certainly not experienced myself, that some of those around him at times were not so humble, but somebody has to be the hardnosed one sometimes in business. I would like to think that what you’re saying is true. However, I have heard too many stories and seen too many photographers who at least come across as arrogant, who do very, very well. I’m not sure how many other photographers they inspire, and that may be your point, but some of them seem to strike a chord and play it very well for a long, long time. Nonetheless, I feel my father rested easier at night, looked at himself more steadily in the mirror and died feeling good about his life and the way he lived it, which says everything. Also, he would often tell interviewers and bystanders that he considered himself rich in all the important things in life, which to me is much better than wealth alone. Photographer or not, I think that’s a great way one should aim to live their life, David. Very good thoughts indeed. Sadly, despite my hope about the arrogant, I’m afraid you’re right: I’ve had interactions with a couple of very arrogant AND successful. While I don’t hope they fail, the arrogance is bothersome. Thank you for your comments, Greg. I agree with your sentiments about the arrogant expressed in your last sentence. Hi David, here in Germany I have learned that arrogance in photography goes very often parallell with the format of the pictures. You only need to downsize the huge image, and you will notice that there isn’t much left over. In contrast: Some years ago in the nineties I stood before some little treasures by Alfred Stieglitz. Contact prints of some of his equivalents. Each one a little world of beauty and humility. Fascinating discussion David. While “not in control” isn’t necessarily the way I would describe the experience of photographing nature (I am the one who takes credit for setting the alarm so early in the morning and actually getting up! 🙂 ), there is a certain synergy that either takes place or it doesn’t. I can’t tell you how many times I have ventured out and came back with a feeling of being connected, or completely disconnected from the images of the day. So many different factors influence our abilities to see. Those opportunities certainly don’t just appear before us. The process of discovery in nature photography is probably one of the grandest games of hide and seek. A very thought provoking post as usual. I love the image. I remember the flowers and gnarly roots from my one brief visit to Point Lobos. It remains one of my regrets I did not spend more time there and hope to return soon. Hi Mark, thank you for adding to the conversation. The synergy between photographer and landscape, when conditions are ideal is an aspect I hadn’t thought about until you mentioned it. Now that you do, I feel that perhaps that is a key part of what Edward Weston was talking about in the quote above and what he did so well. It is also what makes looking at your blog so enjoyable. I recently got William Albert Allard’s retrospective, Five Decades, and he thanks all of his subjects for giving him photos to take, not to be mistaken for create or make. I think that is the level of respect that all of us should have for our subjects as well. No photographer is god’s gift no matter how much some would like to believe. Much like music arrangers, we take something pre-existing and rearrange elements but are not the creator. Photography is an art but let’s not overstate our own self-importance. Appreciate your participation, Richard. Thanking subjects seems like a worth while perspective of William Albert Allard’s. His photographs are interesting too. Interesting post and interesting comments. I believe that all great artists, whether egomaniacs or humble souls, produce their art from a quiet place inside whether they admit it or not. No matter how still we are, we still have personalities, likes and dislikes and that will be part of our images. Ultimately the image has to speak for itself. A Zen Master’s mind is probably quieter than mine, or Edward Weston’s, but give him a camera and is he a better photographer? A quiet mind and non-egoic personality might be helpful in actualizing one’s talent, however it’s the talent that’s the prerequisite. Hi Dan, welcome to Landscape Photography Blogger and thank you for your comment. As I wrote on your blog, I was so pleased to see your high quality photography coming out of Boulder, Colorado and Colorado in general. Besides Chris Brown, John Ward and a few others, Colorado seems a bit slim on good photographic art. I agree with you that this is generally the case in all states. As we agreed people do not have refined taste in art mainly due to not experiencing the difference enough. Probably the creators of the art produce lesser quality photography, paintings, sculpture or whatever for the same reason. Great read, some things I definitely should have been more familiar with. While ‘art as expression of the artist’ doesn’t tell the whole story, if it doesn’t at least in part describe one’s work, I think they have some thinking to do. Hi Matt, I agree. Introspection and self exploration are important to developing a sense of yourself as an artist. Putting yourself in your art, on the other hand, is a choice that is not a requirement for a photograph or any other expression to be considered art, though some would argue that it is unavoidable. Even those who chose to take themselves out of the equation as much as possible, are by this very decision, showing themselves in their art by their absence. Besides, many would argue the artist is still evident in some form because someone has to decide what’s in the frame, how the photograph is post processed or developed, reproduced and presented.